1. Wash rice and soak in enough water for 4 hours. Wash all the dals together and soak in enough water for 2 hours along with red chillies. 2. Grind the rice smoothly. Then add grind the dal coarsely, along with the red chillies, black pepper and half of the curry leaves. 3. Mix the dal and rice together. Add asafoetida, rest of the curry leaves, salt and mix well. Keep aside for 4-5 hours. 1. Heat the tawa/griddle. 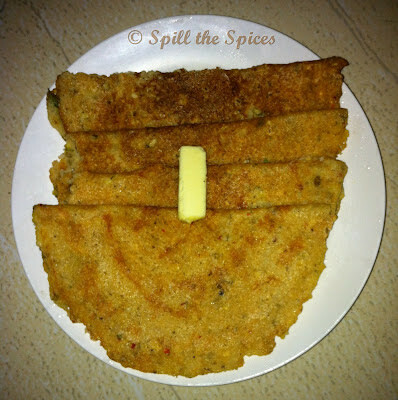 Pour a ladleful of adai batter and spread it like dosa and make it as thin as possible. Pour 1 tsp oil all round the edges and in the center. 2. Cook till its golden brown in color. Now flip the adai and cook till the other side also turns golden brown. Serve hot with butter and powdered jaggery or with chutney. Hi Sona, Thanks for stopping my blog and leading me to your space. you have a good collection of recipes and the adai looks so crispy and healthy.